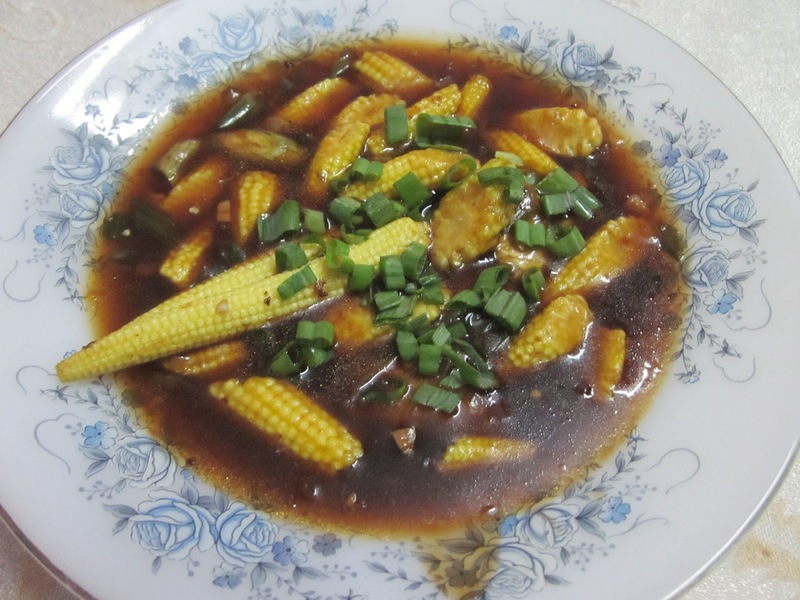 The Tummy Tales: Baby Corn Manchurian!!! As is the case with most holidays, we ate and ate and traveled and tanned. One resolution we made on the way back home was go light on the food (no prizes for guessing why… Lol) over the next few days. That is perhaps why, you will see a nearly stir-fry dish making it to the blog today. But, to understand today’s recipe you need to understand a cuisine called Indo-Chinese. A cuisine that’s perhaps a cross between the Indian taste and Chinese stir fry. Honestly, any Indian would swear by this; proof of which is the millions and millions of carts (and small dingy restaurants) with their trademark glaring red colour and signs saying “Authentic Chinese served here”. One of the most famous dishes of the Indo-Chinese is the Chicken Manchurian very simply bite sized chicken bits covered in a batter deep fried and thrown into a tangy sauce. But folks, the only way to stay in the game is through product diversification and so, considering the huge Indian appetite for vegetarian food all sorts of vegetarians options started coming up, the most famous among them being “Gobhi (cauliflower) Manchurian” and followed closely by “Paneer (Cottage Cheese) Manchurian”. For today, the humble baby corn basks in glory. We had it with Sichuan Fried Rice. But goes well with steamed rice as well. Cut the babycorn into bite sized pieces. Coat them with cornflour and keep for 10 minutes. Heat oil in a pan and fry the baby corn till just about a golden brown. Remove and drain on an absorbent paper. Sprinkle very little salt and some white pepper powder powder and keep aside. Now, heat the remaining 2 tablespoon oil and add in the garlic. Saute till reddish brown. Add the onions and saute. Once done, ad the soya sauce and tomato ketchup. Stir for a minute. Add the baby corn and mix well so that the sauces cover them well. Add in the stock or water and let it boil. Meanwhile, dissolve the remaining cornflour in some water and keep aside.